My WIP Wednesday, Starfall, is finished at last! It was such a great stash buster, I've already started on a second one. I ended up using 249 fabrics in the top + 4 more as a scrappy binding. I am teaching a class on how to make the 4 stars that make up this quilt as a class at Honey Bee this fall. The dates are Tuesdays September 15th & October 20th (part 1 and 2). Sign-ups will start August 16th. I will share everything I've learned about how to make these stars come out nice and flat, with beautiful points! Round 3 of Starfall is finished and my fabric count is now up to 164 different fabrics. The stars this week remind me of ninja throwing stars, the way they seem to spin! Next week I'm making 17 wonky stars, then I can start putting everything together. I've decided to teach this quilt as a two part class at Honey Bee Quilt Store this fall. It is a great quilt for learning to piece stars, because of all the different techniques used. Last week I got to share the first set of stars I made for the Starfall quilt by Fresh Lemons. This week I have the second set of stars! Sticking with my scrap box like before and trying to use as many different fabrics as possible, my current count is up to 123 different fabrics. I haven't repeated any of my colored fabrics (that I know of), but the neutrals are getting some repetition. In my quest to use as many different fabrics as possible, some of the neutrals are busier than I would have normally picked. I'm sitting on my hands and making a new rule that I can't redo blocks. It is what it is and I.....can't...change.....anything....no matter...what....arrrrghhhhh! (Cue sininging "Let it Go" in my head then screaming "arrrghhhh" again because that song is impossible to get out of your head!). I'm sticking to the rule because I've been finding that as I go I'm thinking "oh me, oh my, this will never work" and then stepping back to discover something unexpectedly AWESOME! So, I want to see how that works out overall. I had a minor meltdown the first time we were having company over to visit our new home, when I realized (last minute) that I didn't have a quilt big enough for the guest bed. I'd made quilts that size, but they all went to other homes or up to the store. What were my guests going to think if they came to visit a quilter's house and were given a ratty old quilt! Now don't get me wrong, I love my ratty old quilts. They have a lot of history and love and they were handed down to me by my Great-Grandmother-Minor (the first quilter I remember). They are not the quilts she thought of as her best (though I do have some of those), but rather the colorful patchwork quilts made from remnants of everyday life. It is really a high honor to be handed one of these quilts to snuggle with, because they are some of my most treasured and I want to preserve them. But at face value...wellllll, someone could be confused. So...before the next guests arrived, I started out to make something new for the guest room. I ended up using one of the Villa Rosa Postcard Patterns (Lady Taylor). It was quick and simple and showed off some of my favorite fabrics. An added bonus was that it was the perfect quilt for the fun green and teal backing fabric I've been hoarding. Now my guest room has its own bright and happy quilt and my well loved quilts are back in their place of honor on my quilt rack. 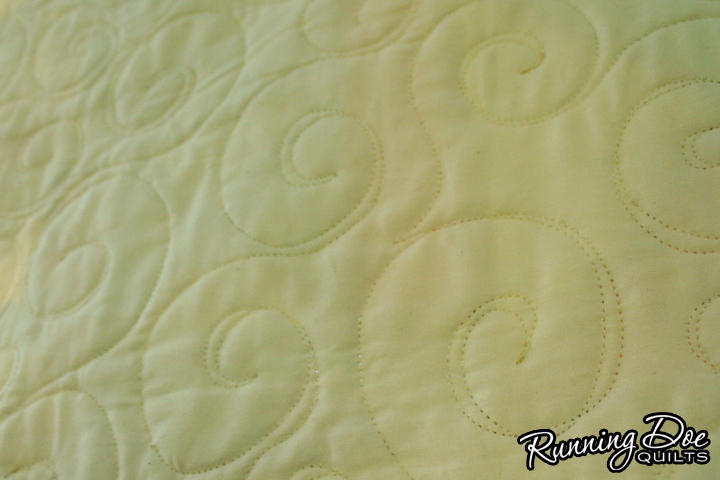 Here is another great store sample I made for Honey Bee Quilt Store. I like the fun way the southwestern flair of the pattern plays with the quirky colors in the fabric line. An added bonus was that I decided to use this quilt to try out a new free motion quilting pattern from the Free-Motion Quilting with Angela Walters book. This one was called "swirled hook." I love swirls and I do a great job with them. My hook still needs some practice, but it's not bad for a first attempt! This quilt is a combination of Anna Maria Horner's Loominous fabrics, a gray American Made Brand solid, and the stacked pattern by Sew Many Creations. 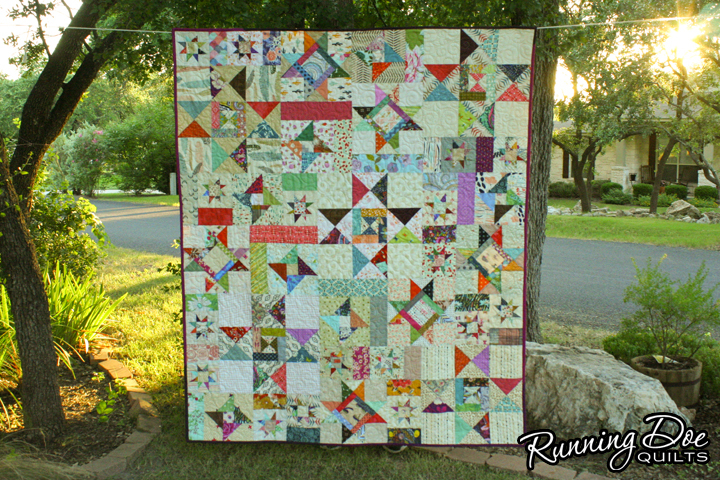 There are a limited number of kits available through Honey Bee Quilt Store. I am in love with everything about this quilt! My Grandma taught me how my Great Grandmother would use up her leftover bits of fabric by crazy piecing them onto squares of newspaper and then sewing the squares together to make a quilt. I had used this informal method of paper/ string piecing before and really loved the results. It always comes out so colorful and scrappy! I feel like this pattern (made by Freshly Pieced) took that idea to the next level by adding some structure to the crazy. The definite placement of colors and the varied block heights combine to create a really dramatic visual. If you would like to make this exact quilt, there are a limited number of kits available at Honey Bee Quilt Store in Austin, Tx (where I work). Just call (512)257-1269. The fabric is from Urban Chick's line "Nomad" and the pattern is "Gridlock" by Freshly Pieced. This quilt was started with no real goal in mind. The fabric was just sitting on the shelf calling my name! When I pick the pattern for the fabric, I'm usually trying to come up with something to show off a fabric (or collection) I love and not trying to impress the world with my sewing genius. The pattern I came up with is very simple and allowed me to show off the larger print fabrics like the farm scene and use up all the random smaller cuts of fabric I had purchased in a fun scrappy way. Because this quilt took me a while to get around to finishing, these exact fabrics would be hard to find again. But I think the pattern lends itself to any number of fabric collections. If you would like the full pattern download you can find it for FREE here.